Sohu Sports (in China) is reporting that Yao had a chat with Hakeem Olajuwon in the hallways of Toyota Center after the Rockets-Raptors game Friday night (see photo below). 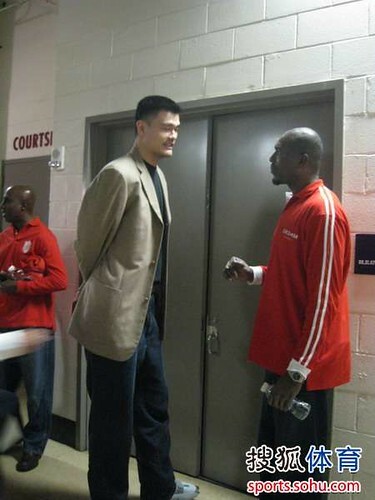 Click here for more photos of Yao and Dream together in the hallway of Toyota Center. Sohu Sports: Talk to us about Yao Ming’s injury; (they said) that may end his career. Olajuwon: That’s really very very disappointing, because I know he really wanted to continue playing the game. I just talked with him; I aked him to continue his efforts, to give it another try, and see if he can come back to play as well as to maintain a positive attitude. He said he will give his best try. Sohu Sports: So what do you think Yao Ming has brought to this team ? Olajuwon: You should know the answer; they really need him. He can make the team even better, a huge difference. It’s really very frustrating to see him go through such an injury. He must continue to strive hard for a comeback. Sohu Sports: Do you think he can come back to play the game? Olajuwon: Yes, I firmly believe so. He’s a man of strong character. Click here for the Sohu Sports story written in Chinese. Hakeem was at the game to promote the launch of his new clothing line called “Dr34m.” Click on this link (same as the link below the photo) to see Olajuwon signing autographs for fans who bought some of his new designs that went on sale Friday night at Toyota Center. This entry was posted on Saturday, January 1st, 2011 at 5:57 am	and is filed under Injury and rehab. You can follow any responses to this entry through the RSS 2.0 feed. Hakeem is Dwight Howard's mentor not Yao.